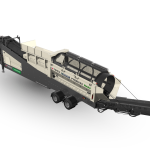 The Phoenix 1600 portable trommel screener has been innovatively designed to provide excellent fuel efficiency and low operating costs, whilst also reducing emissions and noise levels due to the machine running at a low engine RPM. With a 4.9m (16′) x 1.54 (5′) drum, unrivalled production throughput is guaranteed due to the large screening area. 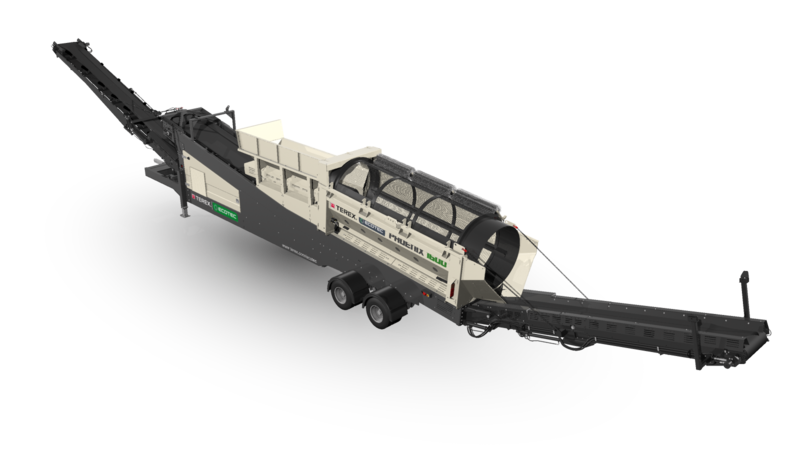 Highly versatile the Phoenix 1600 can easily screen a variety of material including topsoil, compost, sand and gravel, wood chip and C&D waste. Woven mesh or heavy duty punch plate panels can be fitted to the drum ensuring all application requirements are met. The 180° swivel fines conveyor, with a discharge height of 5.9m (19’4″) results in the creation of impressive stockpiles.This swivel feature can be controlled via a remote while the machine is in operation, minimising downtime. The powerful four wheel drive system with high performance friction wheels is used to turn the trommel drum giving operators the ability to run bi-directionally. Powered by a Caterpillar C4.4 engine (Tier 4 Final Constant Speed) the powerful hydraulics and intelligent feed control system ensure the Phoenix 1600 is always working at its optimum. Our trommel screens are highly efficient in the separation and processing of wood chips, top soil, compost, light demolition waste, domestic waste and aggregates. Their rotating drums roll larger pieces of material to allow all fines to flow down and through the trommel screen plates.